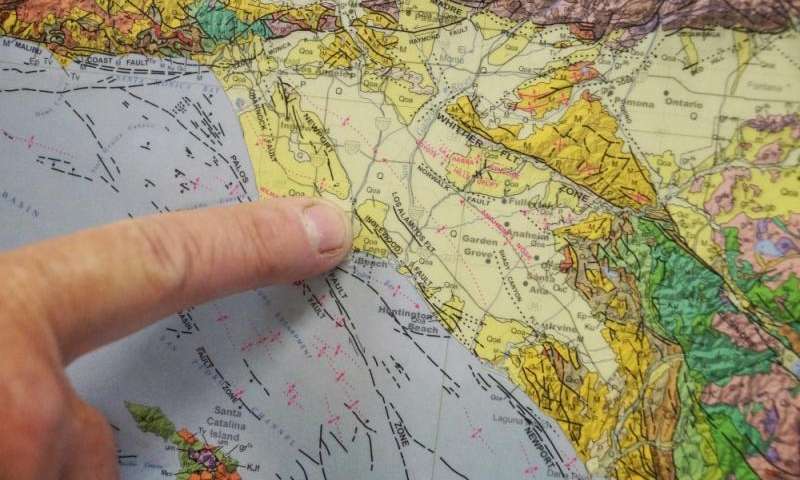 UC Santa Barbara geologist Jim Boles has found evidence of helium leakage from the Earth's mantle along a 30-mile stretch of the Newport-Inglewood Fault Zone in the Los Angeles Basin. Using samples of casing gas from two dozen oil wells ranging from LA's Westside to Newport Beach in Orange County, Boles discovered that more than one-third of the sites—some of the deepest ones—show evidence of high levels of helium-3 (3He). Considered primordial, 3He is a vestige of the Big Bang. Its only terrestrial source is the mantle. Leakage of 3He suggests that the Newport-Inglewood fault is deeper than scientists previously thought. Boles's findings appear in Geochemistry, Geophysics, Geosystems (G-Cubed), an electronic journal of the American Geophysical Union and the Geochemical Society. "The results are unexpected for the area, because the LA Basin is different from where most mantle helium anomalies occur," said Boles, professor emeritus in UCSB's Department of Earth Science. "The Newport-Inglewood fault appears to sit on a 30-million-year-old subduction zone, so it is surprising that it maintains a significant pathway through the crust." When Boles and his co-authors analyzed the 24 gas samples, they found that high levels of 3He inversely correlate with carbon dioxide (CO2), which Boles noted acts as a carrier gas for 3He. An analysis showed that the CO2 was also from the mantle, confirming leakage from deep inside the Earth. Blueschist found at the bottom of nearby deep wells indicates that the Newport-Inglewood fault is an ancient subduction zone—where two tectonic plates collide—even though its location is more than 40 miles west of the current plate boundary of the San Andreas Fault System. Found 20 miles down, blueschist is a metamorphic rock only revealed when regurgitated to the surface via geologic upheaval. "About 30 million years ago, the Pacific plate was colliding with the North American plate, which created a subduction zone at the Newport-Inglewood fault," Boles explained. "Then somehow that intersection jumped clear over to the present San Andreas Fault, although how this occurred is really not known. This paper shows that the mantle is leaking more at the Newport-Inglewood fault zone than at the San Andreas Fault, which is a new discovery." A geologic cross section of the Los Angeles Basin from the southwest to northeast. This profile intersects the Newport-Inglewood Fault Zone at Long Beach. The study's findings contradict a scientific hypothesis that supports the existence of a major décollement—a low-angle thrust fault—below the surface of the LA Basin. 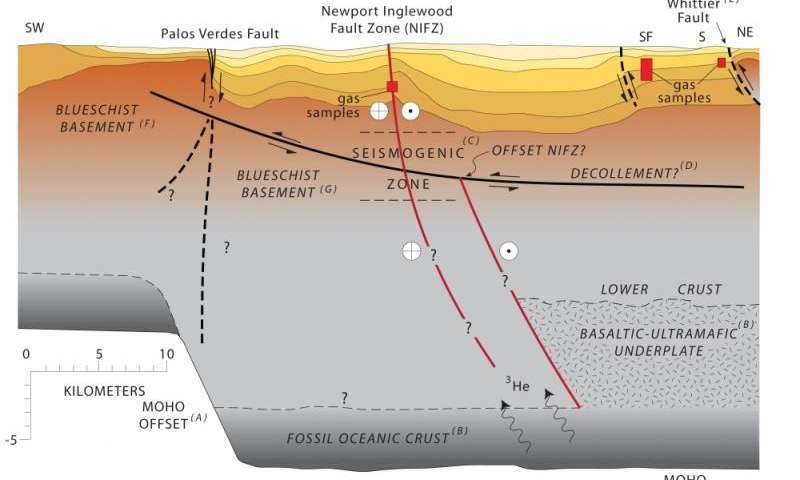 "We show that the Newport-Inglewood fault is not only deep-seated but also directly or indirectly connected with the mantle," Boles said. "If the décollement existed, it would have to cross the Newport-Inglewood fault zone, which isn't likely," he added. "Our findings indicate that the Newport-Inglewood fault is a lot more important than previously thought, but time will tell what the true importance of all this is." A small earthquake has rattled a wide swath of greater Los Angeles, shaking buildings downtown. The U.S. Geological Survey says the magnitude-3.4 quake hit at 7:01 a.m. near Carson. The significant depth of 8½ miles meant fewer people were likely to feel it. But there were more than 2,000 reports on the Geological Survey's website of people feeling the quake. unlike in San Francisco and Los Angeles, 250 miles to the south. Earthquakeshakes central California coast; preliminary magnitude of 6.5 . Aug 15, 2007 ... Earthquake felt in downtown Lima, Peru: eyewitness .... Associated Press writer Alicia Chang in Los Angeles contributed to this report. Because hot weather is called "earthquake weather" in Los Angeles. Oct 29, 2008 ... which was devastated by a strong earthquake. Photo: AP. Los AngelesTimes. Sep 20, 1999 ... The earthquake caused a few brief power outages and other minor damage. Rong- Gong Lin II Los Angeles Times Staff Writer. September 29, 2009. New Madrid Quake Damage Area Map --1811-1812 3. ... LOS ANGELES / SAN FRANCISCO QUAKES. IS EARTH GOING TO BE EVACUATED? www.greatdreams.com/ laware.htm - Similar to LOS ANGELES NEEDS TO BE AWARE. Or potentialearthquake numbers? ..... .
Jul 1, 2014 ... Jim Bakker thinks it will be a huge earthquake in the Los Angeles area, but we can only wait and see. We already know that Los Angeles will be one place.